This tag manager is very powerful when it comes to designing your database since you can classify objects anyway you want. It allows you to assign “tags” to objects. 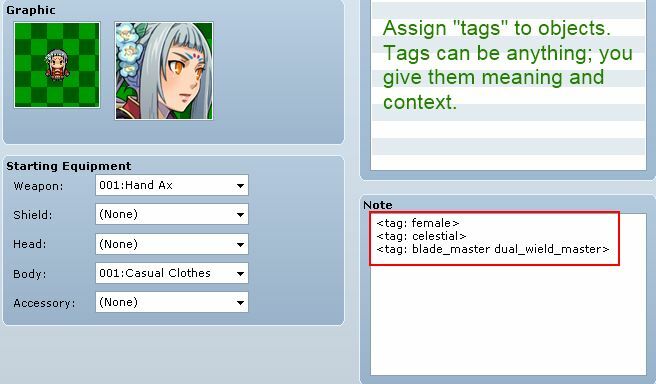 Once tags have been assigned, you can then assign “tag conditions”, which are conditions that must be met in order for an item to be usable. For example, a “collar” might only be equippable by dogs, so you would include a condition that requires an actor to be a “dog” in order to equip it. We start with some basics concepts. An actor’s tags is the collection of all tags that are assigned to the actor, her current class, and any equips or states. For strings x, y. You may have multiple tags in a single note-tag by separating them with the delimiter you have chosen. You can require items or skills to have an effect on the target only when the target has the required tags. Similarly, you can require weapons or armors to be equippable only when all tag conditions are met. All conditions are specified using three basic boolean operators: AND, OR, NOT. “a AND b” means an actor must have both tags to meet the condition. “a OR b” means an actor must have at least one of the tags to meet the condition. “NOT a” means an actor must not have the tag to meet the condition. This script does not support parentheses matching, so you will have to use DeMorgan’s laws to convert them into simpler statements that is recognized by the tag manager. This might be tricky at first if you are not familiar with boolean logic but it is not difficult to understand with practice. Map conditions are used when you require something to be true about the current map. For example, you might have items that are only usable on “world maps”, and this is easily accomplished by adding a map condition for the item and tagging your maps appropriately. Sometimes you would like to explicitly check whether tags exist in your events or other scripts. You can do this by accessing the tags property that is exposed by all Tag Objects. This will return all of the tags that are currently assigned to actor 1. Hey, this might be a really stupid question, but I have no idea how to save this plugin. How do you other people do it? I click on the link and it takes me to the page full of script, but there’s no download button and copying it to notepad doesn’t save it as a JS either. Not sure what to do as there are a number of plugins here I’d like to use, but most of them I can’t for the simple reason of not knowing how to save it in an MV usable file. Hello there. Is it possible to check if weapon equipped by attacker has a tag? Yes, enemies and actors (and any other type of battler) all support tag checking. Awesome, thanks. That’s super useful. Is there anyway to check a map condition using a script or conditional branch? Is it possible to make it so an item is only usable on a certain actor through the use of this script? For example, if I had a character who was a vegetarian, could I make an item called “Hot Dog” that that character would refuse to eat? I can figure out how to make it so that character can’t use the item when selecting from her menu in battle, but if someone else uses it on her she’ll still eat it. You can use this script in combination with Common Event Variables to help you with the logic. The idea is that, if you had a lot of different meat items, you don’t want to have to write separate checks for each and every item. To solve this, you would begin by tagging all your meat items with an appropriate tag, say, “meat”. You would then use the item on an actor, which will call a common event. Which would check if the target is actor 3, and the item has the “meat” tag. You would then fill in the rest of the event normally. It may be silly to ask, but is there a way to add a tag ingame ?? Thank You. By default, no, since all of the tags come from database objects. How would I check if a state has certain tags? That was originally the case but at some point I had updated the script and added a way to check whether a tag exists. I am using this with Yanfly&apos;s class system. What I&apos;m after is being able to change classes and multiclass while carrying with it restrictions and requirements. However, I&apos;m having an issue with getting tags to work on anything other than the primary class. Furthermore, I don&apos;t know how to get tags to affect what classes can be equipped, so, if say the primary class was tagged <tag: Martial> and a secondary class was tagged <tag_cond: !Martial>, that class couldn&apos;t be equipped. Also, is there a way to make tags permanent or become temporary? What I&apos;m aiming for is if a class (or something else) was equipped for a certain event (say, getting to level 5), a tag becomes permanently attached? In the script there is a method called "tag_objects". Add the extra classes to it so that it also checks the secondary class. For anything else specific to the script, you will need someone to write an add-on. There is no support for temporary tags or dynamic tags built-in. I can add support for that if I get around to it, but for yanfly’s script you’ll have to find someone else to do it. Could just attach a tag to a status and apply that, if I’m reading the script properly. Other scripts exist to make states permanent and only removable via event commands. isn&apos;t the top one suppose to be Distributive Laws? Ya it is. Might have mixed it up when I was writing them. Could this be used to label skills as physical or magical & provide a method to check for them under specific circumstances such as; making a sleeping target only awake up to ‘physical’ damage & not magical? Or have enemies use counter-skills based on whether they were hit with a physical or magical skill? You would need to have other scripts that make use of the tags in order to have that kind of functionality. The thing still works as if every monster is Level 0…clearly did something wrong. First time working with Ruby; do you have suggestions? Thanks. 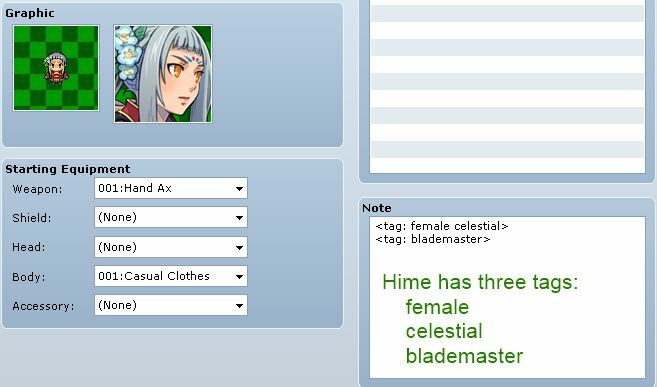 I have a script (Custom Battle) that changes the battler’s appearance via a note tag for each actor. The script asks for a notetag “battler[name]” To determine the graphic you want for them. But in the script I cannot find a way to change what the battler can be /in/ game. Say if the actor’s appearance was changed.. How would I go about it changing the battler, without having to make a whole new character? Is there a way I can use your script to fix this? I don’t know what your script is but this script does not manage existing note-tags or extend the functionality of any scripts that use note-tags. “Tag” strictly means an arbitraty word that is assigned to an object. Can this be applied to skill targets too? Like a vampire’s feeding skill only applying to living targets? (as opposed to undead skeletons and such). 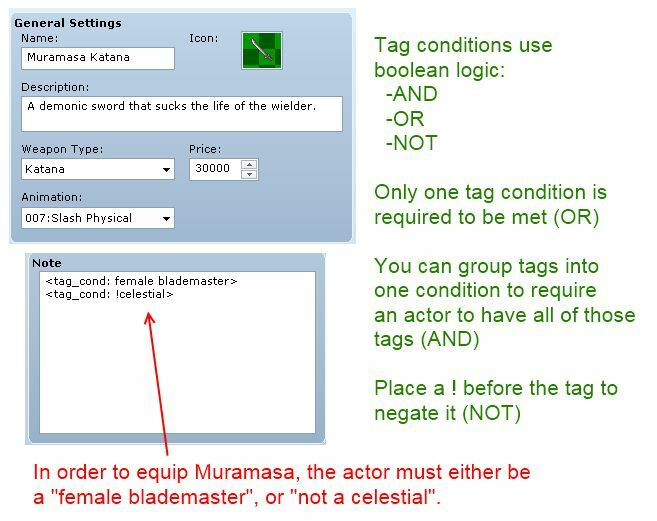 Yes, just add a tag condition to the skill and then add the appropriate tags to your enemies/actors. Then the skill will only have an effect on the target if the target meets the tag conditions.